The world has many things in it -- many colors, sizes and all kinds of variations but there is one constant through all things --- friendship. 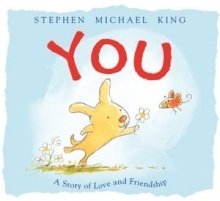 In YOU: A STORY OF LOVE AND FRIENDSHIP, Stephen Michael King creates a cute yet meaningful story about friendship. The illustrations add all sorts of dimensions to this children's tale -- humor, variety and a wonderful sweetness without sappiness. The different scenes are age appropriate and educational for very young children. The story itself is timeless and appropriate for all ages. YOU would obviously make a great Valentine's gift as well as book to use in the classroom around Valentine's Day. If like myself, you are an adult who loves children's books, YOU is also a wonderful book for adults and for gifts to adults. YOU is also a book for birthdays, anniversaries, or even for friends and family in the hospital or ill or just going through a difficult time. YOU: A STORY OF LOVE AND FRIENDSHIP has a simple message which touches the heart.